The Fm 20 is a center console open boat featuring an elegant and balanced design, shared with the entire Rascala's range which consist of 9 open boats. It is suitable for a wide variety of applications, including short coastal cruises and fishing. Its particular design and the accurate project work have optimized the space available on board, offering a choice of different options in the lay-out of the cockpit and the bow area. The latter may be fitted with an extensible sunbathing area or a practical dinette with table. The same modular concept is applied in the cockpit where the pilot seat feature a movable back which create a second dinette area together with the stern settee. The Rascala FM 20 is offered with an interesting package which, according to Rascala's marketing philosophy, propose different Mercury outboard engines in the 75 - 150 hp range. The tested unit was fitted with a 115 hp engine, probably the best choice for this boat in respect of performance and consumption. The overall peculiar capabilities of the hull were enhanced by the excellent thrust of the engine: maneuverability, seakeeping and trim are always excellent. All this, together with a complete list of standard accessories, highlight the already interesting price to quality ratio. Construction material and detailing: unsinkable fiber reinforced plastic hull (two foam cored longitudinal girder provide buoyancy in case of hull damage); self draining cockpit. 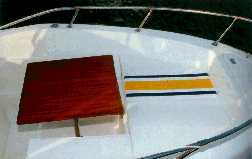 Deck: two bow cleats and two stern cleats, convertible sunbathing area, pilot seat with movable back to create a second dinette area, Iroko wood toe rail in the amidship area, cushions, swimming ladder, navigational lights and electric bilge pump. Steering comfort: central steering console with two-persons pilot seat windshield and stainless steel handrail, wood and steel steering wheel, throttles, electrical control panel, log, rev. counter, cooling water temperature, voltmeter, trim indicator, compass, fuel level (on the 150 stainless steel tank). Optional: wooden cradle, watertight canvas, sun canvas, center console protection. Blue/grey and green/beige color potions are available.